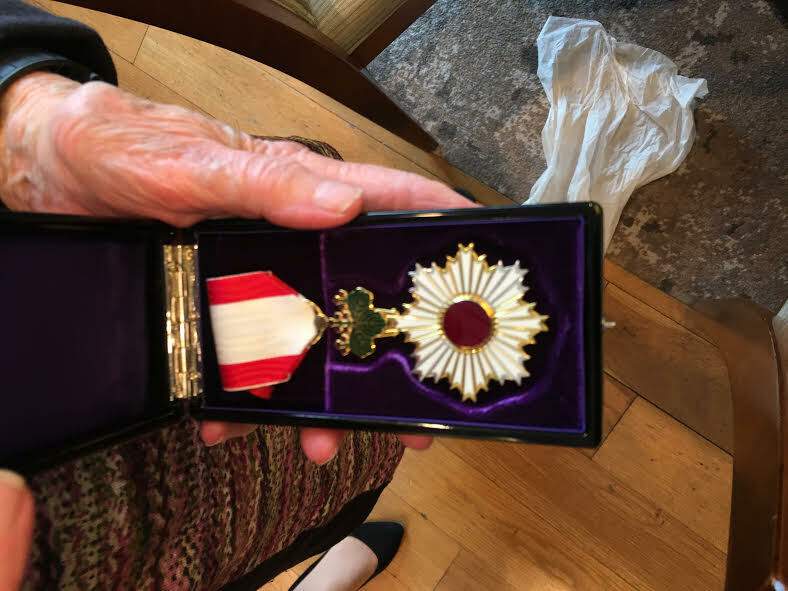 St. David's Society Japan is a non-profit friendship society for the Welsh, those with Welsh ancestry or simply any nationalities with an interest in Wales, its culture and the Welsh language aiming to and support and promote cultural ties between Japan and Wales. 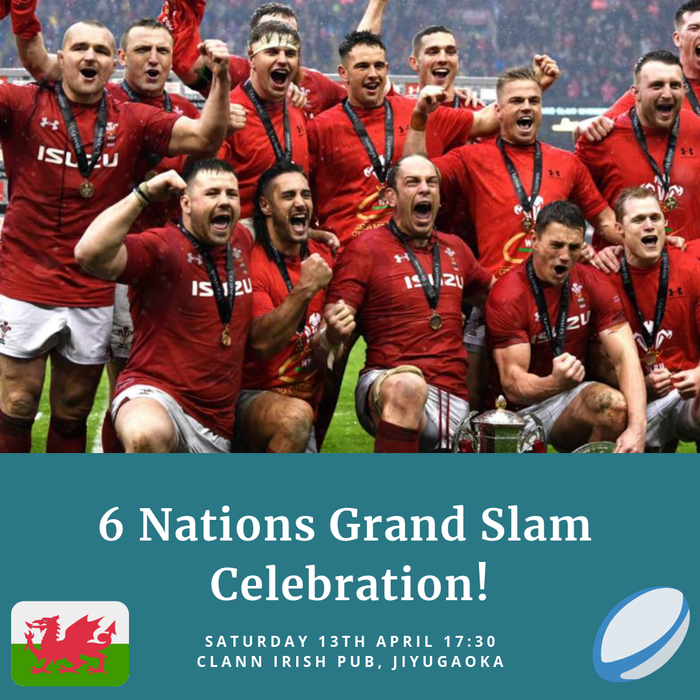 Join us to celebrate Wales winning the 6 nations grand slam! Join us in celebrating Wales winning the 6 nations grand slam! When: Saturday 13th April, 17:30 onwards. students, "Journey to “Multi-cultural” UK and Ireland"
The occasion this year was rather special, as it was exactly 100 years since the 1918 Armistice, and the ceremony took place on Sunday the 11th of November at eleven o’clock exactly. This year the New Zealand Embassy was organizing, and as usual, the St. David’s Society was able to participate. We were blessed with perfect weather, which was an added plus. Spokespersons from various faiths said prayers, which served as a reminder that so many people from the old colonies participated in the hostilities. There were readings of poems by John McCrae’s In Flanders Fields and Binyon’s They Shall Not Grow Old. The Last Post was sounded and at exactly 11 am. there was two minutes’ silence, followed by the laying of the wreaths and I felt honoured to be able to lay one on behalf of our Society. All in all, a very touching and tasteful ceremony. In her words, the Order of the Rising Sun. Gold and Silver Rays is mainly given to people at the bottom of the list who do all the work themselves. As usual Doreen is being very polite about the wonderful work she has done promoting Sumo over many years in English. 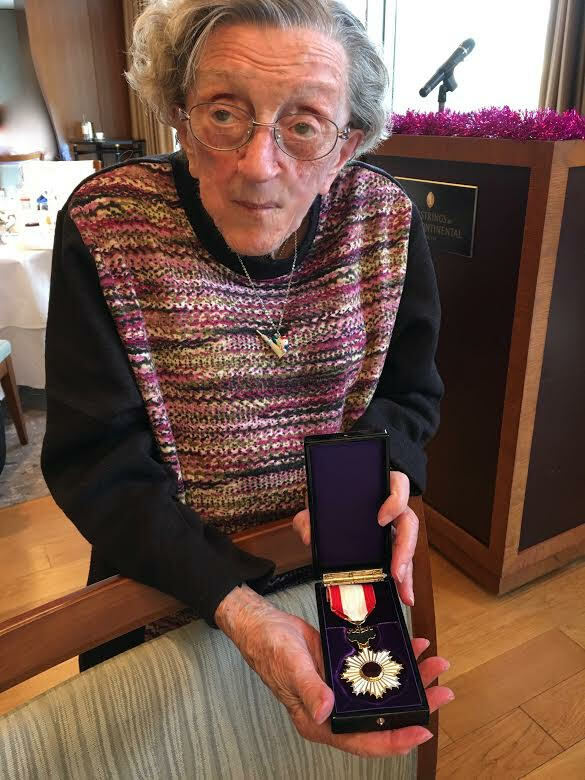 For our society she has been an invaluable singer of Welsh songs and helped us win the Inter-loyal- society's brain bowl. Newydd da: byddaf yn cynnig gwersi Japaneg, Cymraeg, Saesneg i Siaradwyr Ieithoedd Eraill, Piano, Clarinet, Darllen Cerddoriaeth, a Theori Cerddoriaeth. Byddaf hefyd yn ymgymryd â gwaith cyfieithu a golygu, ac ar gael i gyfeilio mewn arholiadau Associated Board. Wele’r atodiadau am fanylion pellach. Byddaf yn gweithio o gartref (Kirton Close, Radyr Way, Y Tyllgoed); mae hefyd fodd dysgu iaith ar skype. Os oes diddordeb gennych chi, eich plant neu eich cydnabod mewn dysgu gyda fi eleni, cysylltwch am ymgynghoriad. Byddaf yn gwerthfawrogi unrhyw gymorth y gallwch ei gynnig drwy ledu’r gair ar lafar, drwy ebostio, neu osod ffleiar yn y gweithle ac ati. 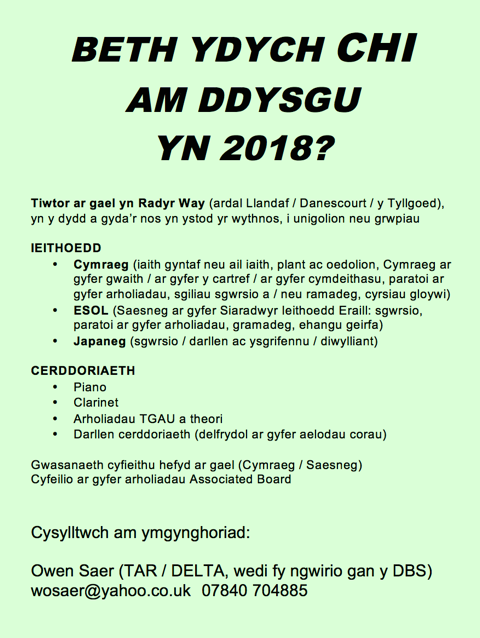 Pob hwyl ichi ar gyfer 2018. Good news: I will be offering lessons in Japanese, Welsh, English to Speakers of Other Languages, Piano, Clarinet, Sight Singing, and Music Theory. 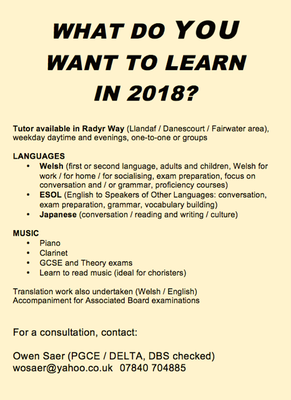 I will also be taking on translation and proofreading work (Welsh/English), and will be available to accompany in Associated Board examinations. See attachments for further details. I will be working from home (Kirton Close, Radyr Way, Fairwater); Ianguages can also be taught via skype. If you, your children or your acquaintances are interested, please contact me for a consultation. I would appreciate any help you can offer in spreading the word verbally, by email, or by posting a flyer in your workplace and so forth. All the best to you for 2018. 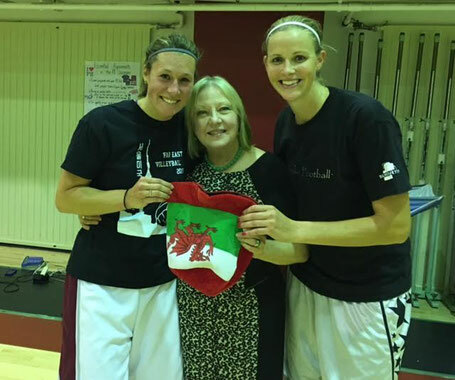 It was with pleasure that Ursula Bartlett, President of the St David's Welsh Society Of Japan presented their donation to Elizabeth Jury and Brittany Wilkins for the Seisen Women's Football Team. The donation had been collected at the St David's Society event showing the film "Don't Take Me Home", which showcased recent Welsh success in the Euro 2016. A big thank you to all for attending the wonderful event with a special thank you to The Clann for being great hosts. You can view the photos in the photo section of our website. Top 20 beautiful roads in Europe" North Wales is awarded as one of Top 20 "Road of Castles in a country in Wonderland/Wales. Welsh Government will exhibit at E-23 (East 1 hall) in the Europe square for the first time. “Road of castles in a country of Wonderland/Wales” is now again awarded as “Top 20 beautiful roads in Europe” by JATA in August 2017.
at Tourism Expo/Tokyo Big Site on Saturday 23th and Sunday 24th of September 2017. Please come to Tourism Expo to meet Jim Jones to cheer him up for his promotion of North Wales. Admission fee of the Tourism Expo is JPY1,300. Learn about the history of the Welsh Harp and listen to its magical sounds. Also, enjoy listening to Welsh Folk Songs along to the music. 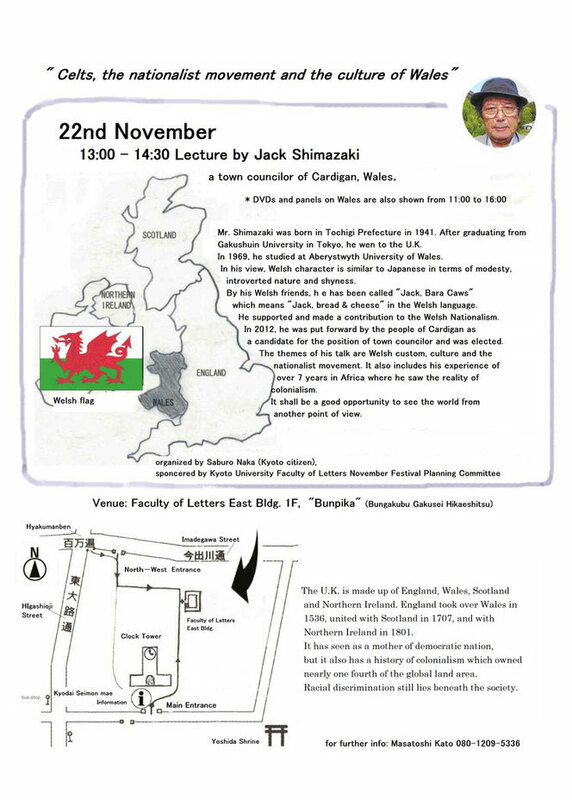 There will be a lecture on Wales at Kyoto University by the first Japanese town councilor in the U.K. Title: "Celts, the nationalist movement and the culture of Wales"
For further information and direction, please refer to the attached flyer. 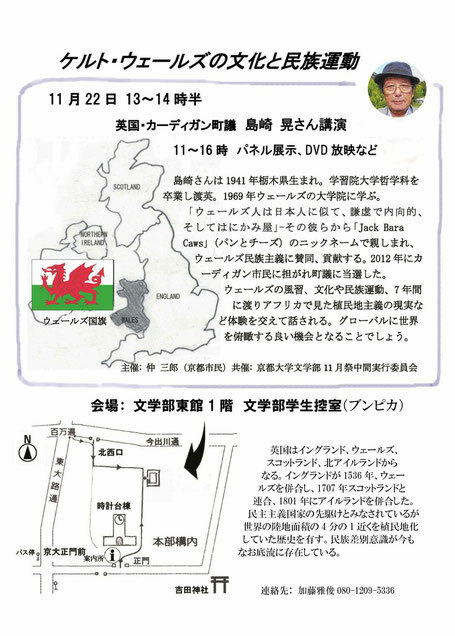 The Welsh First Minister, Carwyn Jones is visiting Japan from September 7th for five days. During his trip he will visit a number of companies with businesses interests in Wales and attend an event at the Embassy to promote Welsh food and drink. To read his speech ahead of his Japan visit see the Welsh Government page. To follow his visit in Japan follow him on Twitter. Cwrs Dwys Haf Aberystwyth / Intensive Welsh Summer Course in Aberystwyth. For further information please see the website or e-mail the Centre. Classes will run over a period of 4 weeks and will be adapted to suit each level. It is possible to join for any number of weeks. 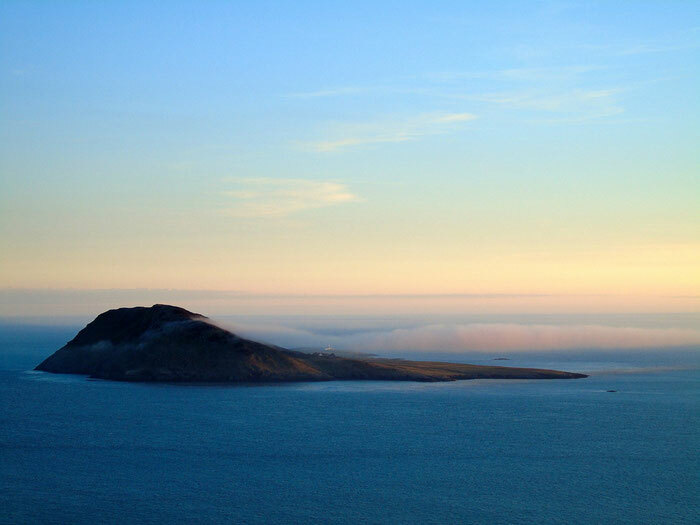 Accommodation is available, with the option of an en-suite or a non en-suite room. For prices, please contact the Centre . neu e-bostiwch y Ganolfan . Mae yna ddosbarth yn rhedeg ar gyfer bob lefel am y 4 wythnos a does ddim rhaid i chi fynychu am y 4 wythnos cyfan. Mae llety hefyd ar gael gyda opsiwn o lety en-suite ac heb en-suite. Am brisiau, cysylltwch â’r Ganolfan. The Welsh Government is providing an opportunity for Welsh businesses to participate in a trade mission to Tokyo, Japan, with a vision to increase Welsh exports to Tokyo and the wider Japanese market. A Dictionary of UK Culture "IGIRISU BUNKA JITEN" (in Japanese), published by Maruzen. The book is made up of 15 chapters, which looks at various aspects of Welsh culture and traditions, including Welsh society, literature, poetry, drama, film, music, art, education, sports, and history. Many members from St. David’s Society, Japan and the Academic Society of Welsh Studies in Japan contributed their work to the book. You are sure to find many familiar names among the authors. It also looks at the other countries in the United Kingdom: England, Scotland and Northern Ireland, with a total of 389 topics covering a range of topics on British culture. The book is divided into sections making it an easy book to either read from cover to cover or just to dip into. Price: 20,000 yen plus consumption tax. 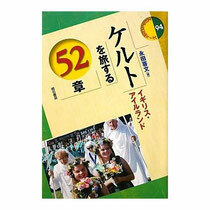 Short Modern Welsh Stories in Japanese, translated by Kuniko Fujisawa, a CDS member. 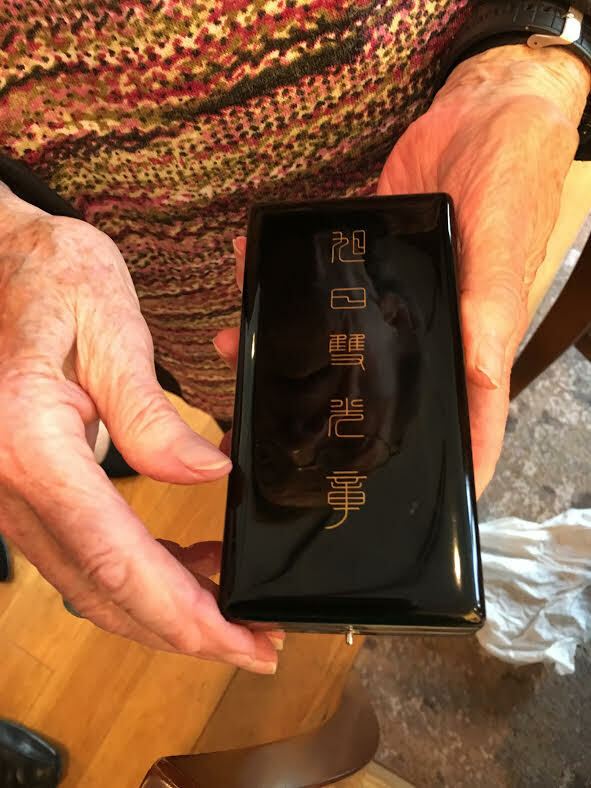 Mrs. Fujisawa is a professional translator who holds Welsh literature deer to her heart. In her new website she introduces short modern Welsh stories from the 20th century to Japanese readers. Mrs. Fujisawa gained copyright permission directly from the authors, copyright holders and other agents to publish this work. As a result of the Welsh Literature Exchange’s corporation and encouragement her ‘Hiraeth’ to Wales was able to be realized. The stories are written in Japanese. Please feel free to share them with others who may be interested in Welsh culture. More stories will appear on the site in the summer. Book on Gerald of Wales published! A book about Gerald of Wales, Giraldus Cambrensis, has just been published! 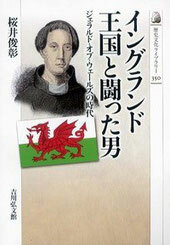 This is most likely the first general interest book, other than academic work, to introduce this Welsh hero to a general Japanese audience. 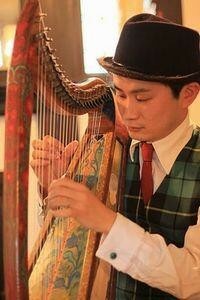 The author, Mr. Toshiaki Sakurai, is one of our CDS members. -- Gerald of Wales no Jidai"
About history in the 12th century, specifically, who Giraldus was, what he won and lost, how he became Welsh, and Mr. Sakurai's affection toward this extraordinary man. You can buy a copy on Amazon JP. "A Journey to Celtic Britain and Ireland"
Mr. Yoshifumi Nagata, is a CDS member, who recently published a guide book on the UK. "A Journey to Celtic Britain and Ireland (52 chapters)"
A wonderful guidebook about Wales, Ireland, Scotland, Manx and other Celtic regions in England looking at their music, legends and historical sites. Includes a 174 Celtic music disk, guides and beautiful photos (taken by the author). Written in Japanese. Do you have any Japanese friends who would like to learn Welsh? If so, there is a new and wonderful and textbook available. It is very user-friendly and written in JAPANESE and WELSH! This textbook is for complete beginners, and each Welsh word has katakana underneath, making it easy to pronounce everything! Grammatical explanations are in Japanese and there is an extensive list of vocabulary (including daily words and place names). It's easy to learn the Welsh language from the very beginning, step by step. 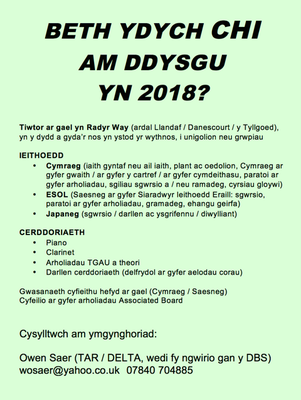 There is also an audio data to help you practice the Welsh pronunciation, which can be downloaded from the above website. If you have any Japanese friends who wish to learn Welsh, pass this information on!